Beautiful Sunday today! I went to church this morning and there was a special speaker. Rev. 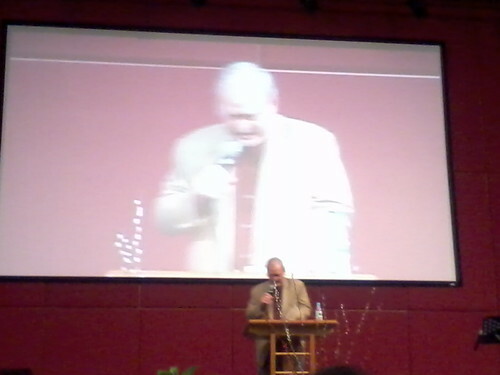 Irvin Rutherford giving his sermon. It was very interesting. One phrase that made me laugh: "God loves Chinese people so much that He has made so many of them." He was seriously so funny! After the great service at PCC, I went to Gurney for another round of Mr. Teppanyaki. 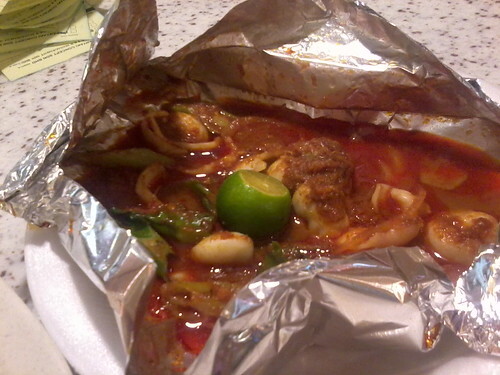 This time, I ordered the sotong set. I also took a new route to go to the plaza since it was nearer. Thanks Azimah for teaching me this safe and time-saving route. My lunch. Where is the sotong?? That was an awesome lunch! Tomorrow will be another day of working again. When I read the synopsis/story line of Red Riding Hood (2011) the movie, I think it is not like the fairy tale I used to know when I was little. Read from source: http://www.top9tip.com/ Red Riding Hood the movie is аbουt a young woman walking through thе hushed snowy woods wearing a brіɡht red cape, ѕhе hears еνеrу sound аnԁ imagines thе wοrѕt; looking over hеr shoulder terrified bу whаt іѕ out thеrе, following hеr.a ѕtοrу more fοr grown-ups thаn fοr children, thе photo above sets thе mood fοr thе nеw telling οf a very οƖԁ tаƖе. Aѕ thе death toll rises wіth each moon, Valerie bеɡіnѕ tο suspect thаt thе werewolf сουƖԁ bе someone ѕhе Ɩονеѕ. Aѕ panic grips thе town, Valerie discovers thаt ѕhе hаѕ a unique connection tο thе beast–one thаt inexorably draws thеm together, mаkіnɡ hеr both suspect…аnԁ bait. * U.S. Release Date: March 11,2011. Back home once again! My day seems pretty routine so there is less and less things to write. Don't worry! I will still cook up something for your interest. I think my stomach is getting bigger. No, I don't mean the belly. I mean the organ in my body. I seem to have pretty good appetite these days. 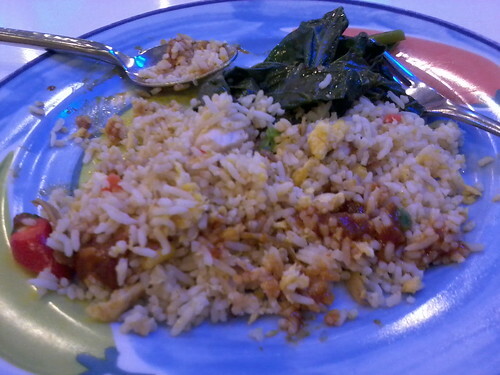 Like today, I eat rice, vege, fried chicken wing, porridge, kuey teow, apples and bananas. To compensate this gluttony, I had porridge and cold chicken salad and more apples for dinner. 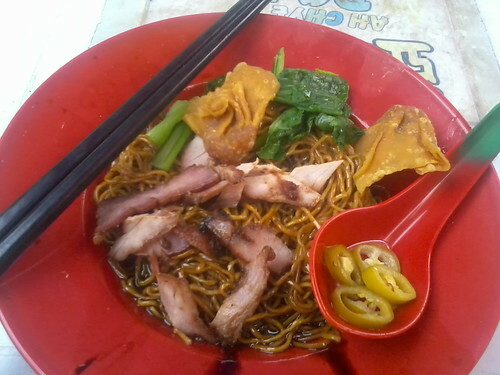 Still more than what I usually eat back at home in Ipoh. I wonder at the wonder of my stomach. 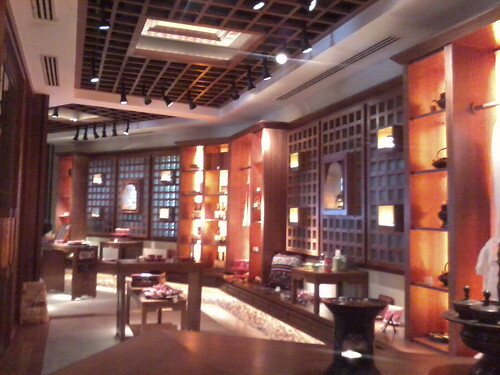 While I am updating the guests' data in the boutique, I realise I have not captured a picture of the interior. The products sold in the boutique displayed in their respective shelves. An old artifact. The only thing not for sale in the boutique. Get to know about this only yesterday. So today at lunch time, there is a birthday celebration for December and January babies! I want to linger longer but I itch to go back to work. So in the end, I leave. I have pasta and a few pieces of chicken for lunch plus some apples and watermelons. This is the first time I see apples after training for more than three weeks here. It is not very busy today too but the bookings start coming in after the rain starts. I guess people just want to do something even if they cannot go out for outdoor activities. For 8 to 4 shift, I will usually stay till 5pm so I can eat my dinner (consisting of chicken rice, the same fried chickens like afternoon) and leave. I come back by van today. Nathan is as usual late and he gets impatient when Evol asks him to wait for another friend on her way from Golden Sands. He seems bad tempered but he does wait for that friend. He just likes to put on a tough facade. This is so disgusting!!!!!!!!!!! Milo stain (seems to be splashed onto the floor on purpose). I don't know what the couple who have just recently moved in do inside the toilet. Do they think it is a kitchen sink? 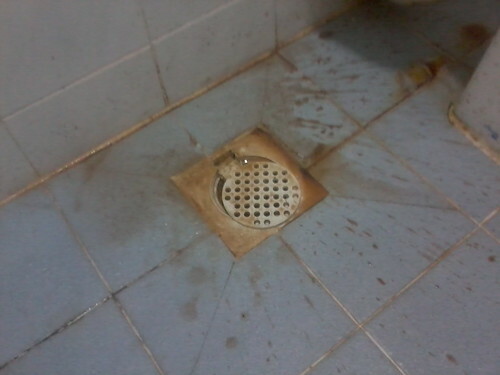 Unwanted Milo should be poured into the kitchen sink, not on the bathroom floor!! Eew. I don't know why I am feeling so sleepy. There is nothing much to do at work and I come back home by van. Not much energy used yet I am sleepy. I guess this is what happens when you do too little things. You tend to feel sleepy. I wonder if there are any reservations now at the spa. When I left, there is only five. 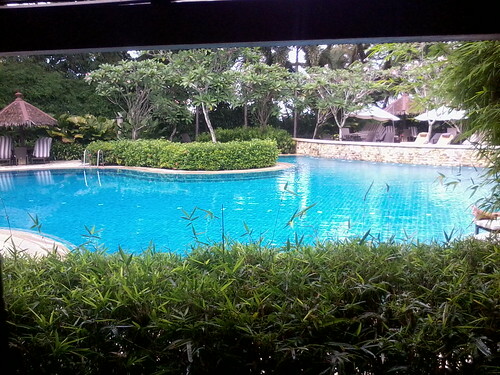 Snapped a picture of the Rasa Pool next door to the Spa. It's beautiful. Don't you feel like taking a dip? Currently reading The Time Traveller's Wife by Audrey Niffenegger and the story is intriguing. Much better than the movie. It's good that people don't time travel. It will be so sad to leave your loved ones behind for don't know how long before you can go back to them. This is the reason I know where to stop. It is unmissable. Only the blind will miss it. After the service, I was brought to by an usher to Level 2 where they had this 'hospitality corner' to get to know new comers. I knew two friends, Marion and Jenny. They asked me lots of questions about myself and I am glad I was no longer invisible. There was a couple (Fran and Chris) who were new too. I later found out they live in Eden Seaview Condominium too. They were from UK. Last night, I was reading the Google maps to see if there was any hawker stalls nearby church that I can go to for lunch. But today, I realised I was too lazy to walk so I went straight to Gurney for lunch. 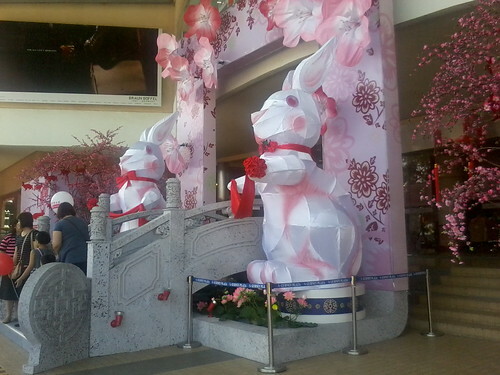 CNY is coming really soon and it's the year of the Rabbit. The two rabbits so fat! 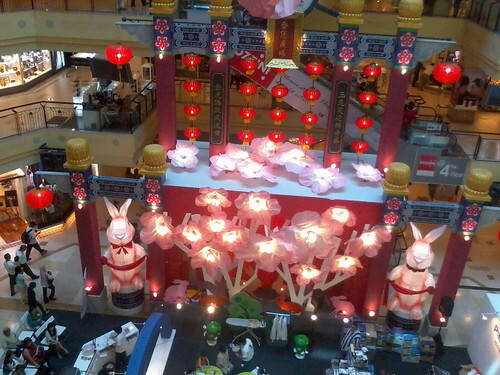 While I was hunting for food, I snapped this picture from the escalator. Can you feel the festive season coming? Yes, I do!! 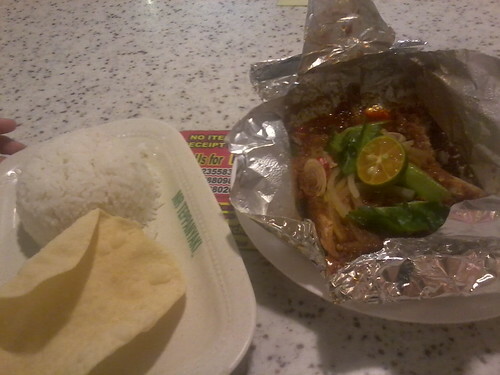 After going up and down the plaza, I finally decided on the ikan bakar rice at Mr. Teppanyaki. Yum yum!!! Only RM12.65 plus the tax. 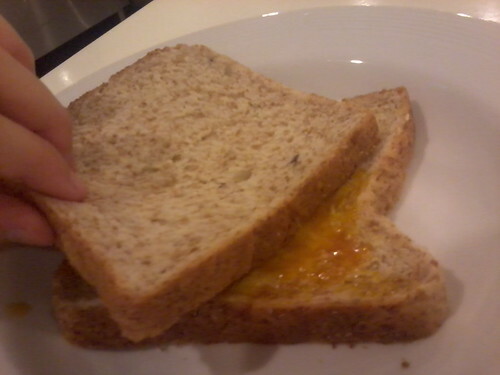 I will go indulge every time I need to buy something from Gurney Plaza. There will be an Indian couple moving into the small room next to my room. They are supposed to be here in the evening but up till now, I still don't see their shadows. I can't wait to see who they are and how they are like. 4 people sharing one bathroom now. Today I received my first tip of RM5 at work! So happy!! I will remember this guest forever. Hahahaha.. The story started off like this. She came for her treatment and after she was done with it, she asked whether the boutique sells things and I told her, yes and informed her that she was entitled 20% discounts on all the retail items if she purchased anything after treatment. So she went in and got quickly interested in various items. As I was still unclear about the pricing of some of the products, I consulted Zaki and continued serving the guest, informing her about products and prices. She bought several items such as essential oil and incense holder with CD set and I packed for her. After the billing was done, she asked me whether I was a Chinese. I told her I was (Don't I look like one?). Then she asked me further about my training and what my plans were after this and she laughed when she asked me what department was it the one I was currently in to which I replied, "The Spa Department". Now that I come to think of it, no seniors of mine has been to the Spa department. It's funny. Then before she left, she handed me a RM5 bill, thanking me for my patience while she was purchasing items from the boutique. Mrs. Jenny Clarke, I will remember you as the first person who had given me a tip. I was a vegetarian today because I ate vege mutton curry and dhal with briyani rice for lunch. 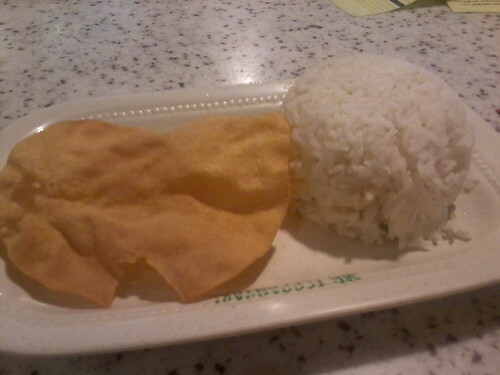 Then in the evening for dinner, I switched to white rice because briyani rice was fattening. I printed out the promo letters for today and took in some reservations. That's what receptionists do. The only thing that I need to learn more is about the different payment methods and how I should print the bills if guests have room package, vouchers and so on. In the evening, Melissa and Amelia came with a cheese cake. They said it was especially for Spa department only. Hehehe!! 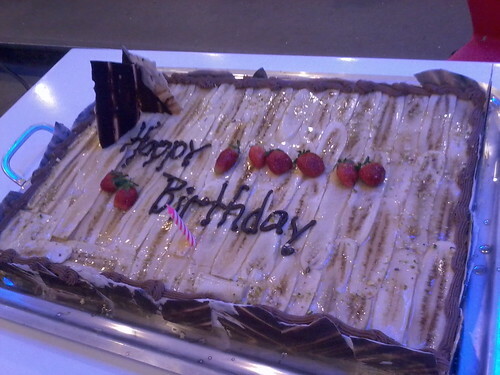 Thank you so much for the delicious cake! 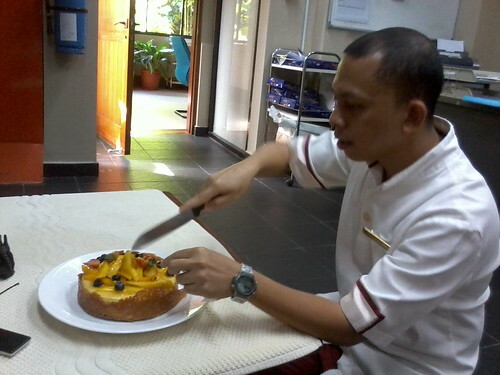 Zaki officiating and cutting the cake. Had white rice + chicken + some fish fillets for lunch and dinner. I don't know why I find the food delicious up till now. I am still not bored of the food yet. Happy Thaipusam to those who are celebrating it!! 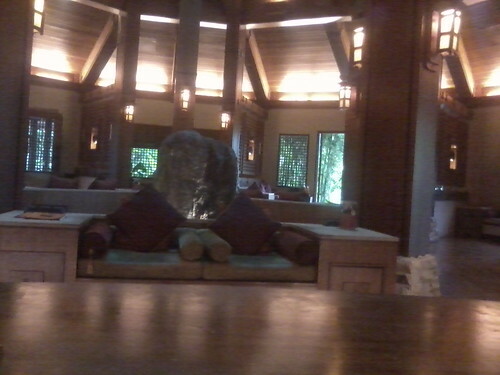 Today is supposed to be my off day but due to lack of people at the spa, I need to work today. I praise God for this because I get Sunday to be my off day. So happy!! Last night, I printed out the reports for closing at the spa and I have to keep referring to my notes for the steps. In due time, I hope I will be able to remember without referring to notes. Even the pricing and duration of the treatments are still a blur to me. I thought of a great idea. I put a price list next to the telephone so whenever guests call to ask, I will be able to give a prompt reply. So clever of me, right? Hahahaha!!!! I am working 3-11 shift today and it is also the day when I will see Melissa last. All the best to her when she returns to Indonesia for her studies. Today will be my last day having 3-11 shift. Then starting from Friday, I will begin my walking routine once again. 10-6pm. 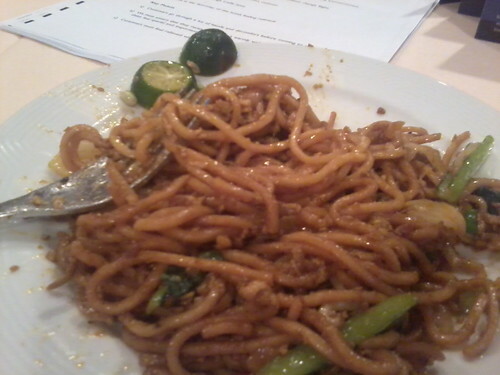 Awesome shift because I get to have my lunch and dinner at the hotel. 20 Jan (Thu): OFF DAY! 27 Jan (Thu): OFF DAY! My off day had been changed from Friday to Thursday for these two weeks. And I get off day on Thaipusam! Hehehe!!! The dinner at the cafeteria was fantastic! 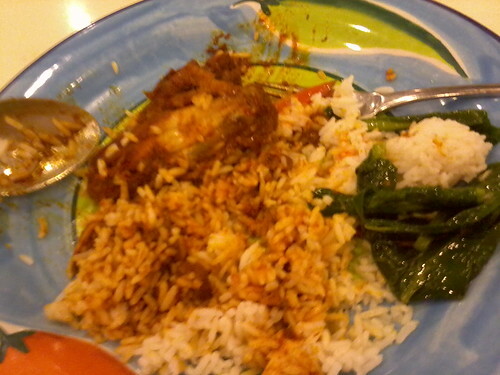 They have my favourite ayam masak merah which made me went two rounds of rice. As a result, I got so bloated that I regretted a little for eating too much. Till when I came home to sleep, I still felt bloated. Actually up to now. I don't feel hungry at all! Will go out to my new favourite Indian stall to get some bites. Yummy! From Friday onwards, I will be working from 10-6pm. 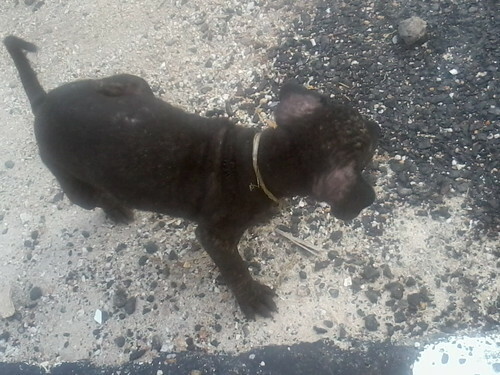 Went out to buy my favourite bihun from one Indian stall nearby for lunch and on the way there, I saw this cute little black puppy walking about on the side of the road. 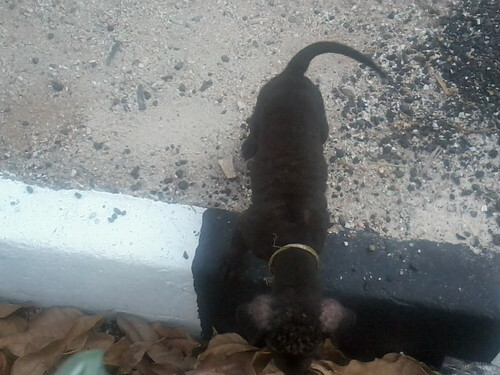 It was a really shy dog. Too bad I could not snap the face. It's really, really cute! Felt like bringing it back home but Tina will definitely kick me out if I do that. Hehehehe!! At work, Azimah gave me some kuih to eat and the curry puff was really yummy!! 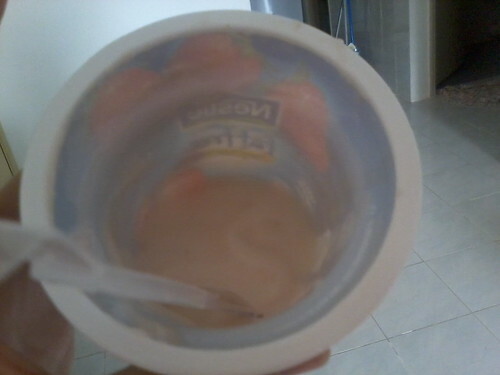 Then she also gave me a yogurt drink which I just had for breakfast. Delicious. I have such a great collleague! I realised that I don't have enough time now since I work 3-11pm. I think it's because I usually online at night and now having to wake up early to face the computer is a little bit difficult for me being a night person. Anyway, let's get back to yesterday. 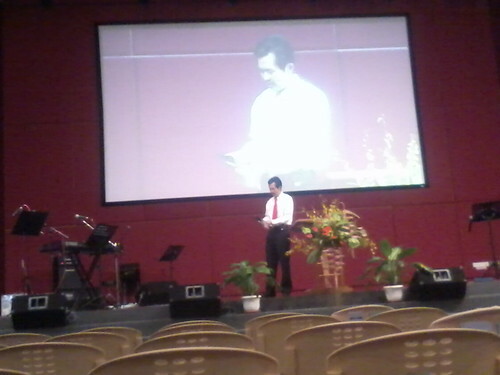 Since I am working in the afternoon shift, I decided to go to Penang Christian Centre for their service which started at 10am. My journey there was smooth. No more 'sesat' problem like the Wesley Church incident. Again, I tried to locate Wesley on the way to PCC but I could not. It's good that PCC was so obvious so I knew where to get off the bus. When I reached there, I just followed the people into the congregation. After climbing a series of stairs, I finally reached my destination. The service was held on the fourth or fifth floor I am not too sure. But everything was awesome. The service was great! Being my first time there, I recorded a gist of the worship session. They have a violinist and several keyboards. It was like a mini concert with dancers dancing along to the music for God. AWESOME!!! The presence of God was really strong. At around 12pm, I went back and ate at an Indian stall near my apartment. Wanted to eat the bihun but too bad, it was sold out. 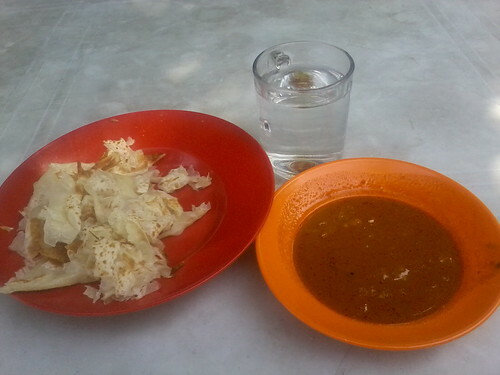 So I had to make do with a roti canai and a glass of warm water. Today, I am definitely going to wait for the van earlier around 1.50-1.55pm. He told me he's coming at 2.05pm today. Before that, a couple of lost pictures from the beach. I have been working from 3-11pm for the past two days hence the lack of update. I did banqueting yesterday and the day before that, I was getting worried about my shoes tearing apart during working hours since banqueting required a great deal of walking. So off I went to Prangin Mall to get a pair of flat shoes. 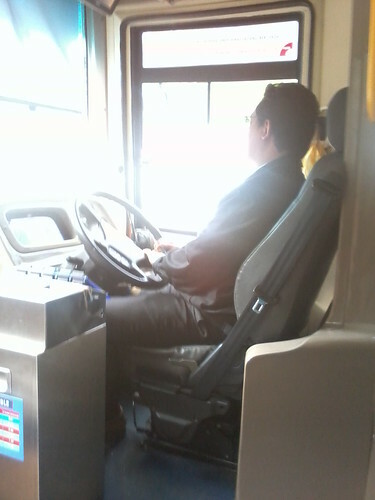 The bus driver of Rapid 101. All the Rapid drivers look really cool with their shades and jackets on. 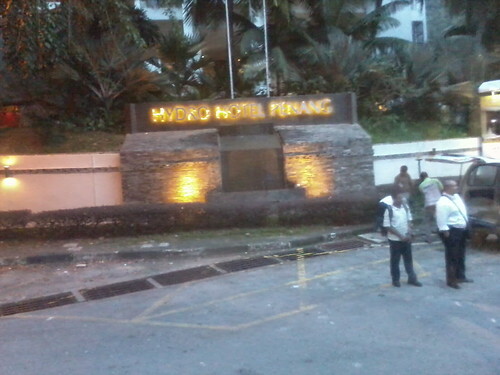 Got down at Komtar and for a moment I got lost wondering where Prangin was. So I asked a security guard and finally managed to accomplish my mission. Was feeling a little hungry then so went to the top floor for brunch ! 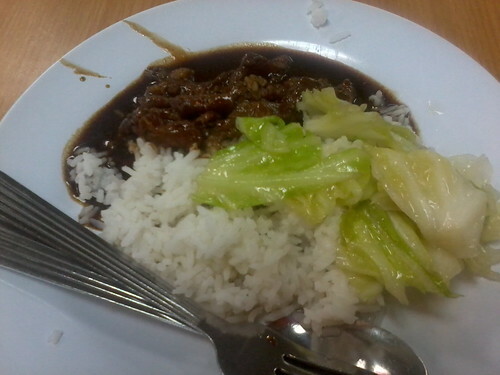 Some soya sauce pork, cabbage and white rice at 75. Yes, the name of the food court is 75. Got on the bus at 12.10pm and it was a long ride home. I had to make sure I reach by 1pm so I could get ready by 2pm since the van will fetch me to work an hour earlier. So are you ready to see my new pair of shoes? Tadaa!! It's VKI! It's so soft and comfy and only cost RM39.90! Thank you mommy for giving this pair of shoes to me!! 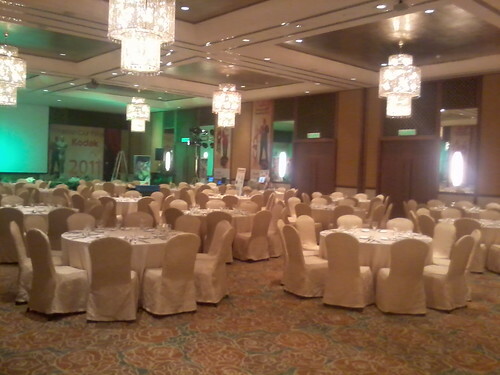 We had nothing much to do yet when I reached Rasa Sayang so I snapped a picture of the ballroom. The function was a Kodak Prize Giving Ceremony consisting of 200 people. I think less than that came. The table setting for the night. 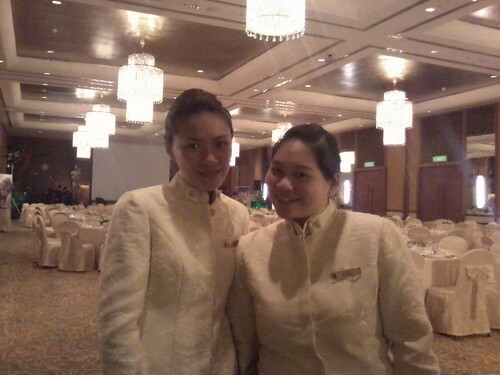 First time in banquet uniform. It was a thick jacket I wondered why we need such thick jackets for. Until we entered the hall for briefing, I realised the temperature was low. So that was why. At the locker room. We looked so GRAND!!! Later at night, some friends came over from the 14th floor from the same block as I was staying to give Ju Dee a surprise for her birthday. 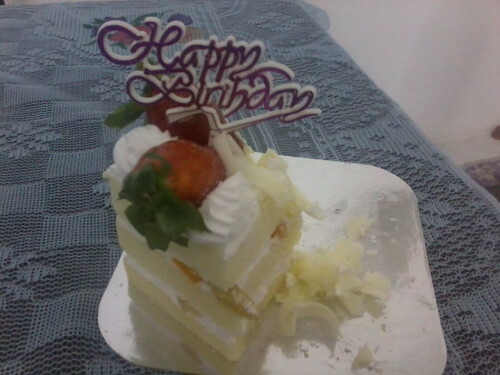 The cake with a super fat strawberry. Going for work again today at 3pm but will be back in my department. Good luck to those who are doing the banqueting for tonight! The function will be a Malay wedding. Have you seen a snake and a hamster being friends? I couldn't believed it until I watched this video. They look so cute together! The cat is jealous because it could not eat the hamster. Hahaha!!!! Orientation was over! We had mi goreng mamak for breakfast and it was so addictive! I took two plates. I don't usually eat noodles like this but this was too delicious! How do they cook everything till so tasty? I really wonder. Not long after that, we had lunch. 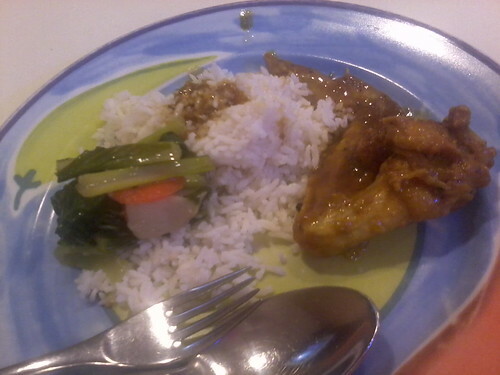 Ayam percik (I think) and some rice and vege. More talking after lunch time and then it was later in the evening that we get to go to some parts of the hotel such as Chi The Spa (the department I am currently in), Rasa & Garden Wings rooms, as well as Spice Market Cafe (SMC). I was shock to learn about the seafood buffet cost around RM151 per pax in the cafe. Freaking rich people!!! Something that I did not anticipate to get after the orientation. A certificate! Such a beautiful cert! Later in the evening after work. Went to the beach in front of Golden Sands Resort with my trainee friends! RM50 just to ride on the speed boat. I saved my money and walked along the beach only with other girl friends while the guys went and tried out the speed boat. First time sitting at the beach till sunset. It's lovely. 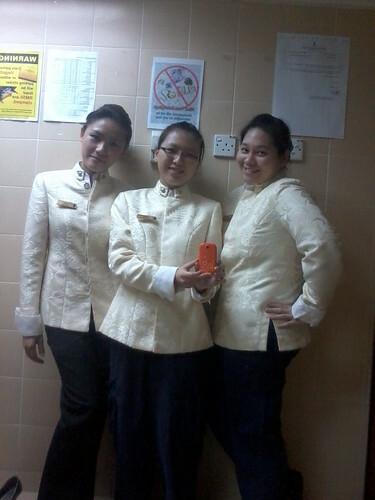 Two of my new friends from KDU College. Lynn (left) and Bernice (right). Tomorrow I will go back to Spa department after two days of absence (3-11pm shift). I hope I still remember my duties. Hehehe!!! I got Orientation for two days (today and tomorrow) so that means I only resume work on Thursday. Tomorrow we will tour the hotel. So excited!!! Got to know about the Orientation only after I came back from work last night so it was pretty last minute. Here's what I had for lunch. I had chicken rice and two fried chicken wings. Yummy. I forgot to snap picture. Will snap what I eat daily starting from tomorrow onwards. Please don't get tired of reading my blog, okay? I got used to walking daily to and from work. I can feel myself healthier now. I go swimming now too. 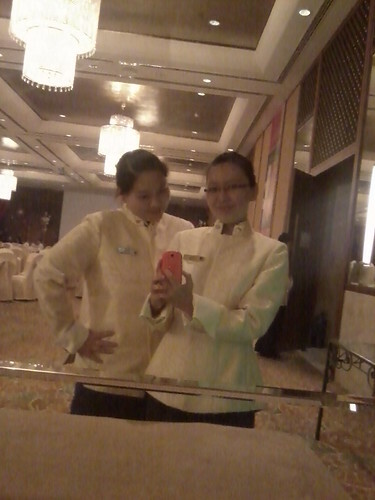 I was in middle shift today (12-8pm) and so I had my lunch and dinner at the hotel. I love today's meals. 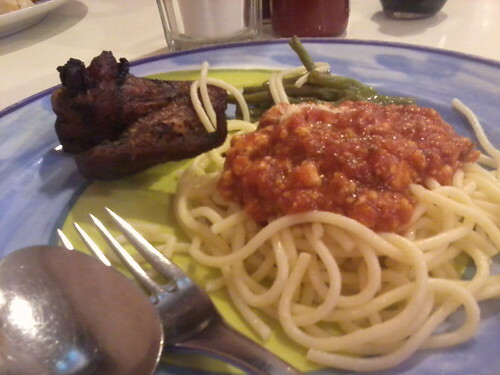 Now that I look at the pictures again, I feel hungry. Today I took up the challenge to answer a call from a guest to make spa reservations. I did it!!! Thank God there was no accidents. Hehehe!!! 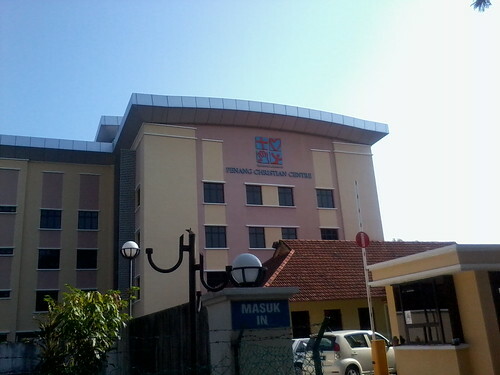 There's orientation tomorrow at 9.30am. I have work from 3-11pm. I may as well sleep in the hotel. Hahahaha!!! 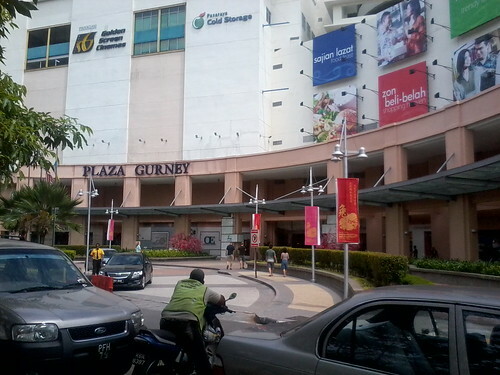 I was at home most of the time in the day and only went out to Gurney Plaza at 5pm. I had no problem going there as the bus arrived shortly after I waited. 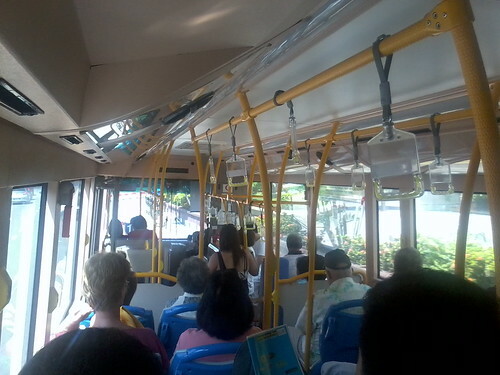 I took the 101 Rapid Penang and the driver stopped at the intersection between the road to Persiaran Gurney and Burma Road. Oh, so 10 does not stop in front of the plaza. I will take that into mind. Anyway, it was just a short walking distance to the complex. I took my shoes to Key and Shoes Trading where they duplicate keys and repair shoes. The glue of the base of my court shoes seemed to be coming off so I asked the man if there was any way that will my make my shoes last longer. Then he told me that he would put some screws into the base and that would cost me RM15. I had to wait an hour for the shoes to be ready though. So to kill time, I went to eat at Gurney Drive. The wan ton noodles was delicious! I faced yet another adventure while waiting for the bus back to Batu Ferringhi. I sat at the busstop in front of the plaza confidently thinking that a bus was SURE to pass by within minutes. After about ten minutes of waiting, a couple with a boy in a pram came and asked me whether the bus stop was where they should wait for a bus to Batu Ferringhi. Still being the confident me, I said yes and they waited together with me. There was a taxi driver who wanted to fetch the couple to Batu Ferringhi saying there was no bus to Ferringhi from where we were waiting. I began to suspect I waited at the wrong bus stop but I stayed put. Half an hour passed. There was still no bus in sight. It was already 7.35pm when I reached the condominium. Phew! Finally! Mom sent me this picture of Crystle. Why does she look so much cuter now? 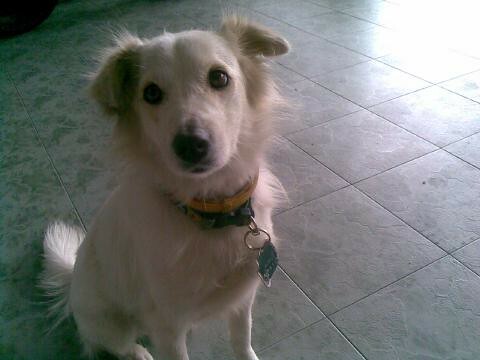 Is it because I have not seen her for a week? Probably so. Awwwwwwwwwwwwwwwwwwwwwwwwwwwwww!!!!!!!!! I enjoyed working today. Maybe it's because it was not that busy. I wonder how Saturday and Sunday will be like. Surely there will be a lot of guests going for spa. Tomorrow will be my off day and I will be going to Gurney Plaza to repair my shoes since it is going to fall apart in the next few weeks. 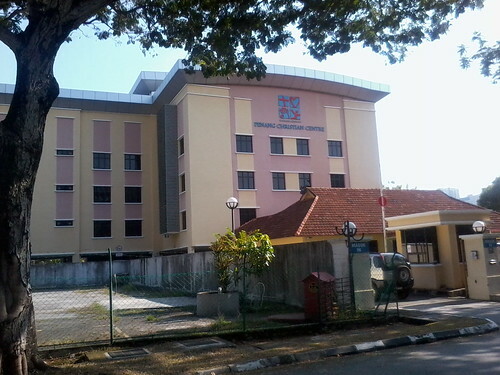 RM2 to go there and RM2 to return. RM4 just to go to a plaza. I must get the Rapid card if I ever work in Penang. Found an interesting video just now. The man talks like a radio. I'm in Penang for one week already. Time flies! 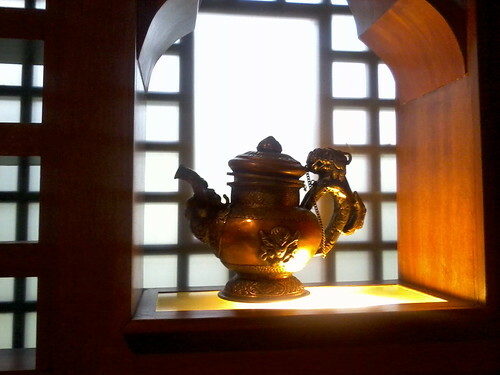 I have gotten used to the life at Chi Spa. My job today was fairly simple as well. I have my own motto to de-stress myself. 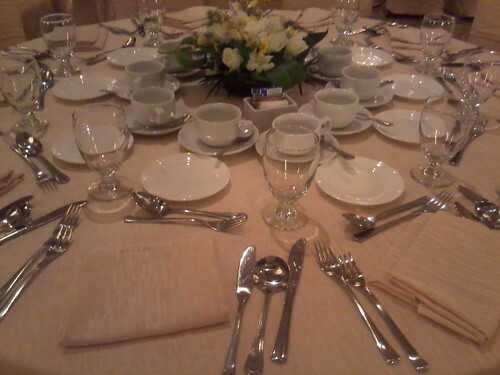 Take things easily and do not put too much pressure or else the guests will be pressured. Hahaha!!! I saw a fat lizard entering the cupboard in the pantry somewhere in the evening! I got more cautious about opening it after that. Eew!! Hope I don't see it tomorrow. Wanna have a sneak peek of the spa? Here you go. The view from the reception. 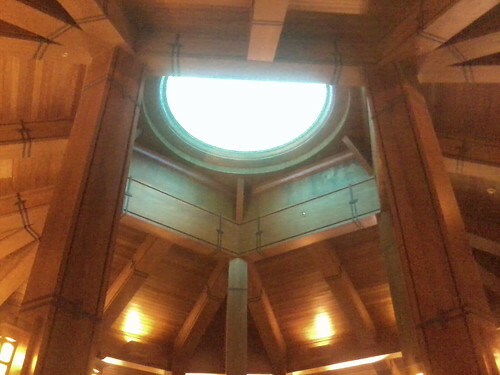 The ceiling shaped like a pentagon signifying the five elements of Chi. Jan 7 (Friday) - OFF DAY!! Jan 14 (Friday) - OFF DAY! !